The combination of a number of electrical quantities into a single quantity through static equipment like summation transformers and sequence networks is already well known. These fit into the concept of static relaying. Summing units can be reduced in size by using new components and techniques, including active elements. Semiconductor circuits are well suited to the use of summing junctions (used in the analogue computation field) and can be applied into protective relaying. initiated by outputs from critical or measuring elements [Fig. 1.10 (a)]. 2.Critical or measuring function—This requires a response to an input when the latter exceeds a prescribed critical level. Switch­ing gain may be included but is not essential since repeat devices can he provided. Practical requirements are fast response, accuracy of setting and high reset ratio. This function is used in many protection systems such as over current, under voltage, over-voltage, differential systems etc. 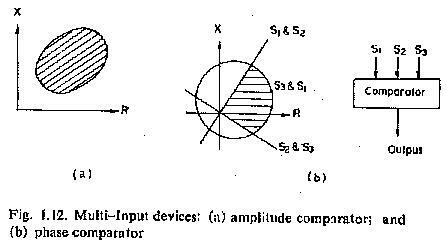 The elements used for these functions may be attracted armature, induction or moving coil This function can also be derived through semiconductor circuits driving electromagnetic relays like polarized moving coil or attracted armature types or reed relays or thyristors [Fig. 1.10 (b)]. 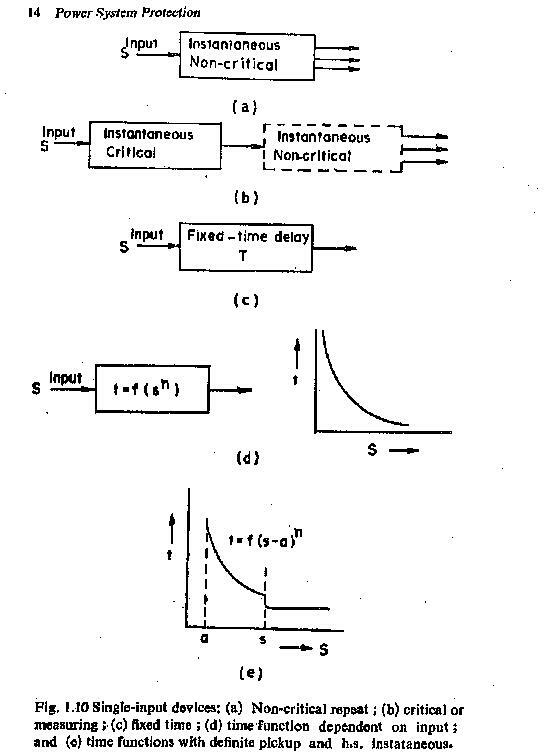 3.Fixed time or definite time function—This necessitates a delay between input and output (between the application of an input and the occurrence of an output or between the removal of an input and the resetting of the output). The input is to be only non-critical (either nothing or greatly in excess of the critical sections can be combined in the inputs circuit. Practical require­ments from these devices are accuracy of time setting and repeatability under successive applications [Fig. 1.10 (c)]. 1.Amplitude comparison—One input is a restraining quantity and the other is an operating quantity so that an output is obtained when the Patio of these quantities is less than a critical value. Ideally the comparison of the amplitudes of the two inputs is independent of the level and phase relationship, of the inputs. The function is represented by a circle in the complex plane with its centre at the origin—defining the boundary of marginal operation. Examples of this are biased relays and impedance type distance relays [Fig, 1.1 (a)]. 2.Phase comparison—Output appears when the inputs have a phase relationship lying within specified limits. Both inputs must exist for an output to occur—ideally the output is independent of their magnitudes, but dependent only on their phase relationship. The function as defined by the boundary of marginal operation is represented by two straight lines from the origin of the complex plane. Examples of these are directional relays, distance relays excluding the impedance type and other phase comparison relays (Fig. 1.11 (b)]. 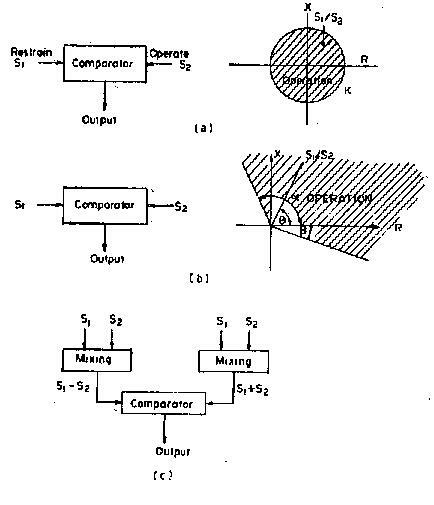 It will also be shown that either comparator becomes equivalent to the other if it is fed through the appropriate mixing units giving the sum and difference of the original inputs. Thus any relay characteristic can be obtained by using the amplitude or the phase comparison principle, although practical considerations might dictate preference for one scheme out of the two. With more than two inputs, the range of complex characteristics is extend­ed. Using amplitude comparison, the remaining conic section curves like ellipse, parabola, hyperbola, etc. can be obtained. Using phase comparison, characteristics are obtained which contain discontinuities as the effective zone is the common area given by a number of straight lines and/or circular characteristics. Equivalence of phase and amplitude comparators does not apply to multi-input case.